There is a saying "you learn something new everyday" and we did just that when we caught up with tour guide Peter Rafferety owner of Walkthemournes.com based in the beautiful Mourne Mountains. Peter really is a fountain of knowledge when it comes to interesting facts on this spectacular area and we couldn't wait to share with you these 5 interesting facts you may not have known about the Mournes. You may find this hard to believe but this 22 mile long, 1.5m high and 0.8m thick wall, which took 18 years to build and crosses 15 mountains was constructed by hand! Built using classic dry stone wall techniques (no motar used!) and granite from local quarries, the wall which encloses 9,000 acres of mountainous terrain, was designed to keep farm animals away from the reservoirs and rivers. The wall passes the peak of each mountain except 'Rocky' where it skirts around the summit. Believe it or not the Mournes has 2 types of carnivorous plant the 'Butterwort' and the 'Sudew', but don't panic contrary to what some people had heard, these plants do NOT! eat humans and the sheep are also safe. As the soil where these plants grow is so poor in nutrients they catch small flies and the dreaded midge to provide their food. Not easily spotted by the untrained eye but the Walk The Mournes guides can usually find some depending on the time of year. The Mournes was once a hiding place for some infamous smugglers.You may have seen clues to this if you have been to Bloody Bridge Car Park. 'The Smugglers Head' sculpture by artist Ralf Sander was inspired by the smuggling activitiy that was rife in the Mournes in the 18th & 19th Centuries. Ships would dock in Newcastle at the foot of the Mountains with their illegal proudce including coffee, tea, silk, tobaccco and wine before trekking their way through the Mournes on horseback along the Brandy Pad which crosses the top of the two valleys. But did you know they had a secret cave to store and hide their goods from customs men? Peter has lots of stories of their escapades hiding from the customs men and will take you into the hidden 'Smugglers Cave' to see where they hid! Certainly not for those of a nervous disposition you will have the opportunity to enter the cave and crawl along a ledge to a small chamber (hopefully Peter remembers the torch!). Most people as they walk through the Mournes think what they see in front of them is the way it was left after the last ice age 10,000 years ago but nothing could be further from the truth. The Mourne Men are famous the world over for their great skill in working with stone, a skill that is not just learnt but bred into them. 150 years ago hundreds of men and boys toiled at cutting the Mourne Granite using only hand tools. The granite stone had many uses in the 18th & 19th centuries for buildings, millstones and was even used in cobbled streets, the stones of which were designed in such a way that that when horses hooves wore down the surface the cobble could be taken out, turned and replaced. You may think that the Mournes had no connection with World War 2 but you will be amazed at the evidence you will find yourself walking on. Shrapnel remnants of bombing practice from off-shore American Navy ships from World War ll (70 years ago) still continue to be found here....don't worry though it's unlikely you'll come across any unexploded shells! The aim of Walkthemournes.com is to help both visitors and locals discover and enjoy all the area has to offer. Some people find it a bit daunting to set out on their own so never actually get to experience the fantastic mountains. This is where Walk The Mournes guided tours are even more beneficial as people have the security of a professional qualified guide to look after them. To find out more about the tours offered check out their website: Walkthemournes.com, phone 028 4176 3297 or email: peter@walkthemournes.com. 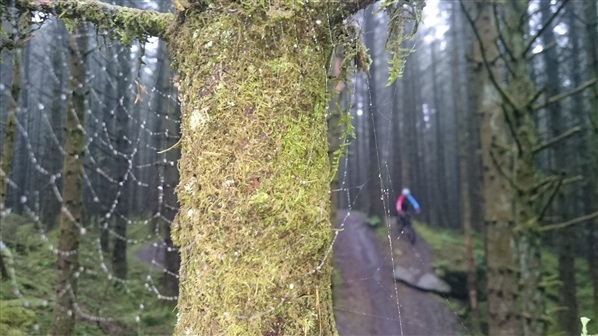 Newry-based mountain biking legend Glyn O'Brien and fellow adventurer wife Catherine took a trip west to Blessingbourne Estate and Davagh Forest recently to visit the mountain bike trails on offer there. On a typically damp summer evening we made our way to the beautiful Blessingbourne Estate, in Fivemiletown, Co.Tyrone. The trailhead at Blessingbourne Estate MTB Trails. The rain certainly hadn't dampened anyone's spirits as the estate was buzzing with families arriving to stay in the fabulous 5 star self-catering accommodation. 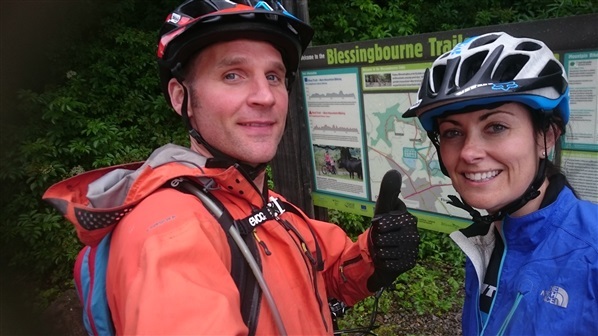 After a warm welcome from Colleen & Nick, we ventured out on the trails, neither of us having been to Blessingbourne since the recent extension. We both had forgotten how much fun could be had on some of the original features such as the Crocodiles back and Snakes trail. From winding boardwalks, flowing berms and skinny log rides to challenging rock drop-off options alongside the main trail, Blessingbourne really has something for everyone. A different view of the Blessingbourne trails with my big head stuck in the middle of it! We were reminded what a fun, family-friendly venue it really is - and so much craic for grown ups too! We even enjoyed a game of table tennis and swing ball after our ride! Next day we arrived at Davagh Forest, situated in Co Tyrone. We noticed that a fabulous new play park had been added since our last visit. Despite the poor weather the trails were busy with riders of all ages. There's something pretty magical about Davagh Forest. 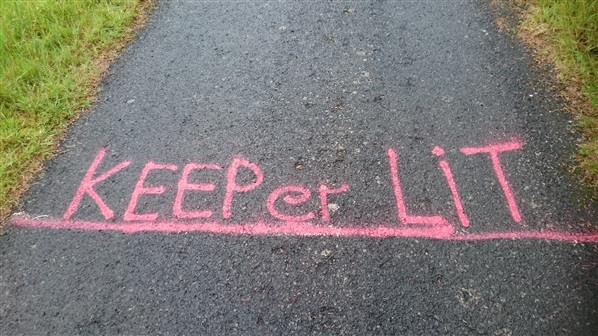 The notorious "Widow Maker" climb never seems to get any easier but the laborious climb is well-rewarded with the sweepy descents of 'Big Wig Jig' and 'Run Ragley Run'. Every time we go to Davagh we always find a new treasure on the trails - with many variations for riders of all abilities. This time was no exception. Although we love the notorious features such as Boundary rock and Wolfs Hill there are many other rocky outcrops to play on along the way. Tearing down one of Davagh's finest trails on a slightly damp summers day. I reckon its better when its wet anyway! 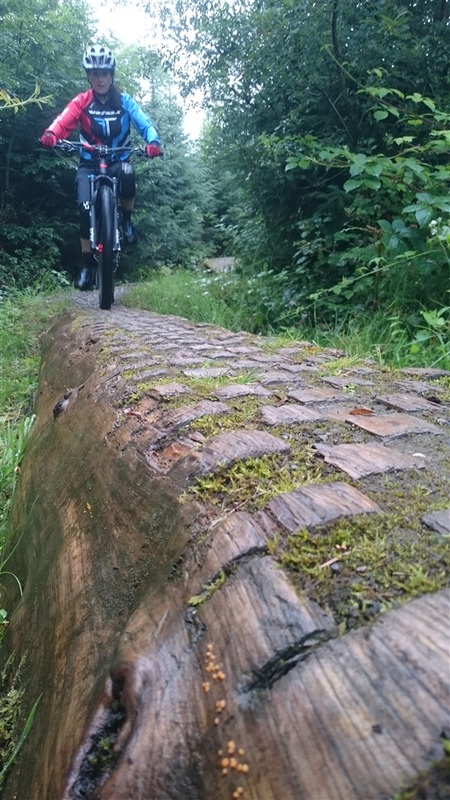 The newer 'Stream trail' is riding like a dream - always a fast few minutes of whoopy fun! 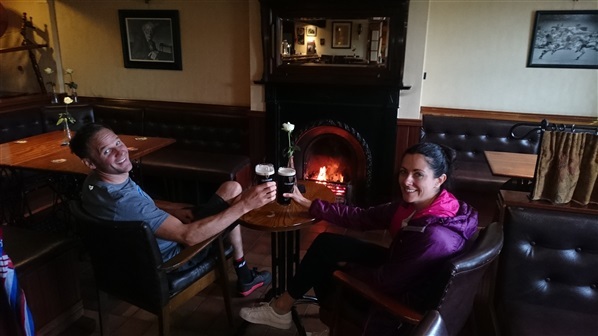 Of course we couldn't leave Davagh without calling into The Sheperds Rest, a family-run bar located just 10minutes from the trail head. We were welcomed in our muddy gear and sat beside a warm fire with a pint of Guinness and a hearty post-ride meal. The pub has been in the family since the 1930s and we enjoyed a bit of a history lesson from Colin the owner. We definitely earned these pints. All in all we had a super weekend re-discovering some of the fun to be had in our local trail centres, and we hope to visit again very soon! Returning home from 3 weeks racing and riding in Europe it was refreshing to be reminded of the fantastic trail centres and facilities we have on our own doorstep! 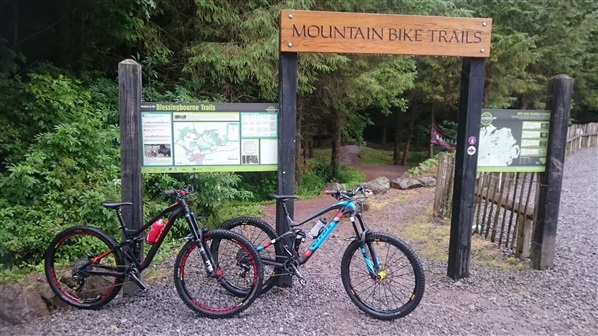 For information on the MTB Trails at Blessingbourne Estate or Davagh Forest visit MountainBikeNI.com. Glyn is the founder of FirstTracksMTB.com - who offer coaching in mountain biking and run the much loved Vitus First Tracks Enduro Cup. Glyn has a career spanning over 30 years on 2 wheels – from BMX, Moto X and DH. Some of his career highlights include 3rd Redbull Rampage, 2nd Masters Worlds Champs and Irish DH Champion. Glyn’s passion for riding remains as strong as ever and he wants to instill his experience and enthusiasm into the rest of the team he races with.